Only after you understand what kind of activity improves your health can you track it. Using this new comprehension of what type of movement improves your health Google has created two new smart ways to track you called Move Minutes and Heart Points. Move Minutes isn’t anything new, it is very similar to other apps which encourage you to move throughout the day. The less time you spend sitting and the more time you spend moving around the better. You’ll earn Move Minutes by making healthier choices such as taking the stairs instead of the elevator or walking away from people who tell you sitting is the new smoking. Getting moving is only half of the equation, however. It also matters what intensity you move and the more intensity the better. This is where Heart Points come into play. You’ll earn Heart Points in Google Fit by doing more vigorous activities. Whether it’s going for a run, playing tennis, or kickboxing give it your all and get your heart pumping. With Google Fit while you’re running, walking, or biking throughout the day the sensors in your phone or watch can help keep track and assign you Move Minutes and Heart Points. There is also a list of activities Google Fit can track within the app ranging from gardening to rowing. Don’t worry about losing credit in your other favorite fitness apps. Google Fit integrates with Strava, Runkeeper, Endomondo, and MyFitnessPal making sure you get credit for every step. The journal will keep track of your activities, achievements, and your goal progress across all of your apps. As you progress you’ll also get tips to adjust your goals and increase your activity even more. 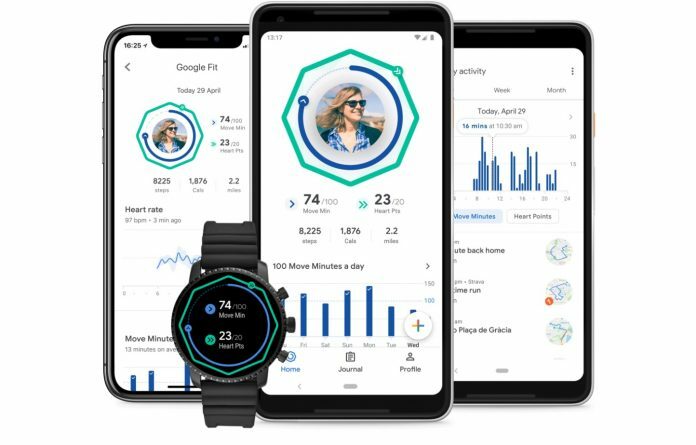 If you’re not seeing the new Google Fit yet, that’s because it is rolling out this week and it may not have hit your device yet. Remember it only takes 30 minutes of brisk walking 5 days a week to reach the AHA and WHO’s recommended amount of physical activity. Studies have shown this reduces your risk of heart disease, improves sleep, and your mental health. If you need a little motivation, then grab the Google Fit app, start earning your Move Minutes and Heart Points, and get fit.